Primary test pistols were a Glock 35 (with an aftermarket barrel) and a Para-Ordnance 16.40 Hi-Cap. The only change made to both was the replacement of the recoil springs. A Glock 22 was also used with no changes. Recoil--I hate it. The immutable laws of physics dictate that when one launches a projectile of a certain weight at a certain velocity, a reactive force, known as recoil, is generated. This force is the primary limiting factor to fast, accurate shooting. Shooters have labored mightily over the decades in an attempt to ameliorate this inconvenient physical reaction. First we fitted our handguns with heavy barrels and various types of weights. Then the muzzle compensator came along, followed by various kinds of barrel porting. Such devices or modifications were the subject of a great deal of study and experimentation and have become extremely efficient. They have found their greatest acceptance among action-pistol shooters, specifically those who compete in matches under the auspices of the U.S. Practical Shooting Association (USPSA). When USPSA rules were standardized, one of the first, and most controversial, was the Power Factor (PF). To make the original Major PF (180), you had two choices: big, heavy bullets at moderate velocities or small, light ones at hyper velocities. Minor PF (125) was easier to make--and easier on the shooter and his pistol--but "shooting Minor" put you at a scoring disadvantage. But what about those shooters who compete in divisions where such technological wonders are not allowed? In USPSA Limited and Limited 10 divisions, recoil-dampening devices are verboten, but with the lowering of the Major PF to 165 it was possible to use lighter-recoiling loads, which helped to a degree. When USPSA introduced Production Division it was seen as a means of attracting new shooters who could compete without the use of the box handguns. Being that, at the time, the most popular handguns on the civilian market were those chambered for the 9mm Parabellum cartridge, it was decided that Production shooters would only have to make Minor PF. This has led to this division being dominated by pistols firing the light-recoiling, inexpensive 9mm cartridge--all well and good, unless you didn't own a 9mm pistol. Four different weights and styles of bullets were used (left to right): Hornady 155-grain XTP, 180-grain XTP, Laser Cast 170-grain SWC and 180-grain TC. Remington brass was used exclusively. The International Defensive Pistol Association (IDPA) is another of the action-pistol disciplines that has become popular with American shooters. While USPSA has become more competition oriented ("Run & Gun & Have Fun"), IDPA claims to be for those shooters who wish to "use practical equipment&apos;¦to solve simulated 'real world' defensive scenarios." IDPA has four divisions: Stock Service Pistol, Enhanced Service Pistol, Custom Defensive Pistol and Stock Service Revolver. As does USPSA, IDPA recognizes ammunition's two power factors: 125,000 and 165,000. (PF equals bullet weight times velocity.) Only those shooters competing in Custom Defensive Pistol are required to get up to the 165,000 level. Next among the most popular types of action-pistol shooting are the so-called Steel Matches. The secret to winning in this discipline is very simple: speed. While most targets only need to be rung to score, even reactive targets (e.g. plates and poppers) are set to go down with a minor-caliber hit. For this reason, the most popular calibers with steel shooters are ultra-light .38 Super and .38 Special loads. Very little recoil is generated by the load consisting of a 180-grain Hornady XTP bullet and 3.2 grains of TiteGroup. Despite the low levels of muzzle flip visible here, with the proper-weight recoil spring the Para functioned flawlessly. Even when fired unsupported, with the .40 Lite loads the Para 16.40 was extremely controllable. Note the ejected cases visible in each photo. Since its introduction, the popularity of the .40 S&W cartridge has been meteoric, and today it is the most widely used law enforcement cartridge in North America. It was only natural that it would become popular on the commercial market, and, if industry reports are to be believed, .40 pistols now account for a large percentage of civilian sales in the U.S. Lest we forget, it has also become the dominant cartridge in USPSA's Limited and Limited 10 divisions. Commercial .40 S&W ammunition is generally loaded with 155-, 165- and 180-grain bullets, with the latter outselling the former pair by a three-to-one margin. Regardless of bullet weight, factory .40 S&W ammunition functions at pressure levels of 30,000 to 35,000 psi. And as most of the pistols chambering it are of the 9mm size and weight, recoil tends to be on the stiff side. While this is not normally problematic for police or defensive purposes, it puts .40 shooters at a disadvantage if they want to compete in the various action-pistol disciplines. As regards Production Division, SSP, ESP and Steel Matches, let's look at the problem from a simplistic viewpoint. When fired from a pistol of more or less equal size and weight, a standard-velocity 115-grain 9mm load will generate considerably less felt recoil than any of the commercial .40 loads. For decades, ammo makers have offered light versions of their more popular cartridges--e.g. .38 Special Wadcutter, .45 ACP Soft Ball target loads, even medium-velocity .357 Magnums--but so far, no manufacturer has seen fit to offer a more user-friendly version of the .40 S&W. This leaves the wannabe Production/SSP/ESP/Steel shooter who owns a .40 pistol with two options: Fight the heavy recoil, or use reloads that push .40 bullets at lower velocities to produce less recoil. No doubt there are legions of .40 owners out there who are right now asking themselves, "Why didn't I think of that?" 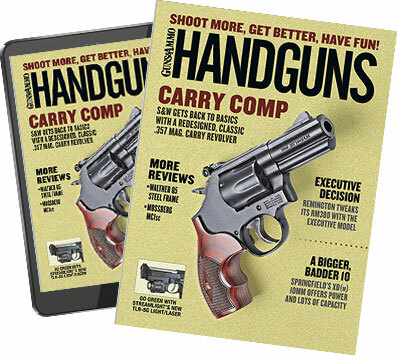 Several years ago I developed carpal tunnel syndrome and tennis elbow in both arms, and all of the writing and handgun shooting I do has only served to exacerbate the condition. This made firing .40 and .45 Major loads painful, and as a result I began competing more and more with 9mm pistols. Being that I could shoot Production Division with my favorite cartridge (yes, the 9mm) without being at a PF disadvantage, this partially counterbalanced the disappointment of not being able to compete with some of my favorite handguns. A few months ago I was straightening out my workshop, and I came upon several shelves full of .40 components that had been gathering dust for some time. Distraught at the thought of all these goodies laying about unused, I began pondering the aforementioned option of using reloads. The perusal of several reloading manuals only heightened my interest, and that evening was spent in front of my Dillon press assembling a sampling of .40 Minor loads. The next day I took myself to the range along with 150 rounds of ".40 Lite" loaded with 180-grain lead and jacketed bullets. After running half of them through my Glock 35, three things became apparent: Recoil was very--and I mean very--light; accuracy was more then adequate; they would not function reliably in my Glock. Specifically, the slide would not lock back on an empty magazine. To verify that this problem was caused by the ammunition, I single loaded and fired 20 rounds of my .40 Major load through the G35, and the slide lock worked every time. OK, back to the drawing board. CCI provided small pistol primers, while Hornady and Laser Cast contributed bullets to the efforts. When I described my problem to my local 'smith, he asked which weight of recoil spring I was using. I told him the factory unit (17 pounds), which led to his suggestion that I try a lighter spring. Accordingly, I contacted Wolff Gunsprings and obtained a sampling of its reduced-power recoil springs and a steel spring guide rod. A bit of experimentation showed that it was necessary to install a 14-pound spring in the Glock to ensure reliable functioning with these particular loads. While I had become fascinated with the concept of lowering the recoil of the .40 cartridge to ultra-manageable levels, I not only had to ensure that it would function reliably in a variety of pistols, I had to keep USPSA and IDPA power factors in mind. Therefore, in addition to my Glock 35, testing was also conducted with a Glock 22 and Para-Ordnance 16.40 Limited pistols. Reloading components were supplied by Winchester, Hodgdon and Alliant (powder); Hornady and Oregon Trail (bullets); CCI (primers); and Remington (brass). As shooting lead bullets in factory Glock barrels cannot be too highly discouraged, I installed an Olympic Arms aftermarket barrel in my Glock 35, while only jacketed-bullet reloads were fired from the Glock 22. As the Para 16.40 is capable of digesting either lead or jacketed projectiles, it was fired as it came out of the box. While other types could no doubt be used, experimentation was limited to four powders popular with action-pistol shooters: Hodgon TiteGroup, Winchester 231, Alliant Bullseye and Power Pistol. Research was initiated by using the minimum recommended powder-charge/bullet combination as listed in the respective manufacturers' reloading manuals, after which I reduced the loads by a few tenths of a grain at a time and chronographed them until I had reached the velocity and PF ranges I wanted. Then each load was tested for functioning and reliability. le to reduce felt recoil to where it was lighter than that generated by standard-velocity 115-grain 9mm ammunition. In fact, when launched from the all-steel Para 16.40, some of the 155-grain loads made it feel almost like I was shooting a .22. This translated into significantly less muzzle flip and the ability to fire fast, accurate follow-up shots. Accuracy: With my three test pistols, every one of the loads listed below provided more than adequate accuracy for action-pistol shooting, training and plinking. Of course, "adequate" is a relative term that depends upon what the shooter expects of a particular handgun/cartridge combination. In my case, shooting offhand I was able to keep all rounds fired inside of the A-zone of an IPSC target at 25 yards. The author and his Glock 35 in USPSA's Production Division. Can you shoot the .40 Lite fast? Note that one steel popper is down, a second is falling, and the author has just hit the third one. Reliability: This proved to be the most challenging area. As you might expect, as bullet velocity decreased, reliability--especially with the 155-grain bullets--deteriorated. In the case of the Glock 35 and Para 16-40, it was necessary to install lighter recoil springs with several of the loads. Depending on the load, to ensure reliable functioning in the Glock 35 I used Wolff recoil springs ranging from 12 to 16 pounds, while the Para required springs ranging from 13 to 16 pounds. Surprisingly, the Glock 22 functioned perfectly with every load I ran through it with the factory recoil spring. I am not listing which springs I used with particular loads, as I believe it is better for the individual shooter to determine this by good old-fashioned trial and error. Power Factors: After all, this was the whole point of this exercise. As can be seen by the chart, while all of these loads made Minor PF, some only did so by the skin of their teeth. As a number of factors can affect bullet velocity, it would behoove anyone using these loads as a starting point in their experimentation to chronograph them out of their particular pistol. And while I was attempting to get as low a PF as possible while still ensuring reliability, I will readily admit that I did not feel comfortable with too low a power factor. For that reason, when shooting competitively I do not use any load with a PF lower than 130. Since perfecting several of these loads, I can now use my Glock 35 to shoot USPSA Production matches without being at a handicap competing against people with light-recoiling 9mm pistols. When loaded with .40 Lite ammo, the Para 16.40 has proven itself to be one of the most accurate pistols I have ever shot and is a premier candidate for those "ringy-dingy" steel matches where power factors are not a major part of the equation but recoil is. I realize there are a lot of shooters out there who own .40 pistols; have friends, wives and/or children whom they'd like to teach to shoot the aforementioned .40 pistols; like your humble author, don't enjoy recoil; and don't shoot competitively. If you fit into any of the above categories, the "Lite .40" will allow you to practice extensively without the downsides presented by recoil. These loads are perfect for introducing new or recoil-shy shooters to .40-caliber pistols. Because of their lower levels of recoil, they produce less wear and tear on your pistol, lengthening its service life. For the cost-conscious among us, these light loads use 20 to 30 percent less propellant. Reloaders will be glad to know that most of these loads deposited the spent cases in a neat pile about two feet to my right--and they're fun to shoot.